Haneda Airport (Tokyo International Airport) > (Keikyu Line) > Shinagawa Sta. > (JR Yamanote Line) > Shinjuku Sta. > (Keio Line) > Sengawa Sta. Haneda Airport (Tokyo International Airport) > (Keikyu Line) > Shinagawa Sta. > (JR Yamanote Line) > Shibuya Sta. > (Keio Inokashira Line) > Meidaimae Sta. > (Keio Line) > Sengawa Sta. Haneda Airport (Tokyo International Airport) > (Tokyo Monorail) > Hamamatsucho Sta. > (JR Yamanote Line) > Shinjuku Sta. > (Keio Line) > Sengawa Sta. Haneda Airport (Tokyo International Airport) > (Tokyo Monorail) > Hamamatsucho Sta. > (JR Yamanote Line) > Shibuya Sta. > (Keio Inokashira Line) > Meidaimae Sta. > (Keio Line) > Sengawa Sta. Haneda Airport (Tokyo International Airport) > (Limousine Bus) > Shinjuku Sta. > (Keio Line) > Sengawa Sta. Haneda Airport (Tokyo International Airport) > (Limousine Bus) > Shibuya Sta. > (Keio Inokashira Line) > Meidaimae Sta. > (Keio Line) > Sengawa Sta. 25 minutes from Shinjuku/Shibuya Sta. Ten-minute walk from Sengawa Sta. Change trains at Sasazuka Sta. on the Toei Shinjuku Subway Line. 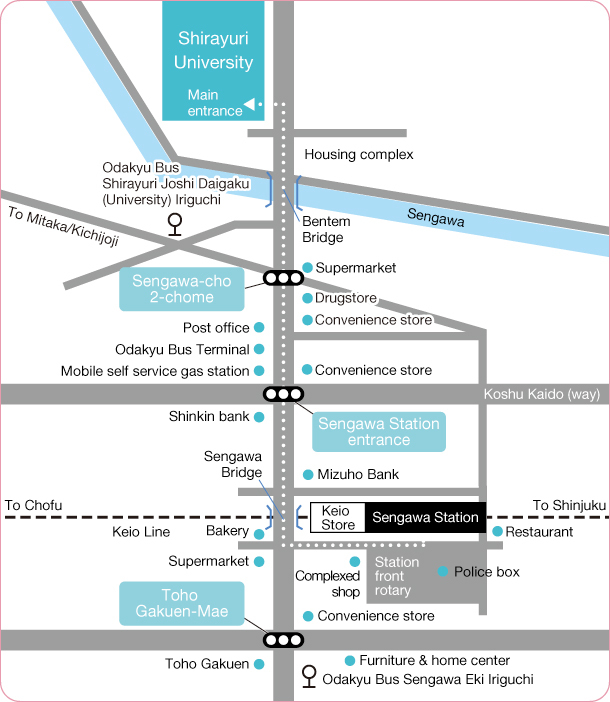 Ten-minute walk from Sengawa Sta. 30-minute ride from JR Kichijoji Sta. (South gate, number 7 bus stop). 5-minute walk from Shirayuri Joshi Daigaku (University) Iriguchi bus stop. 30-minute ride from JR Mitaka Sta. (South gate, number 7 bus stop). 15-minute ride from Odakyu Line Seijogakuen-Mae Sta. (West gate, number 1 bus stop). 15-minute walk from Sengawa Eki Iriguchi bus stop.